American Alpine Institute - Climbing Blog: Successful summit on Ama Dablam! 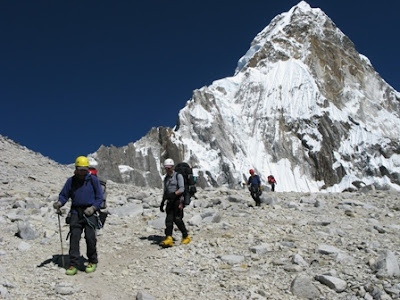 Climbers descend for Base Camp with Ama Dablam in the background. We received word over the weekend that the joint American Alpine Institute/Adventure Consultants expedition has summited Ama Dablam successfully! The first summit team, including three clients, AAI guide Andrew Wexler, and Sherpa guide Lhakpa Dorje, summited between 12:30 and 12:45pm Nepal time on November 2. The second summit team made it to the top as well on November 4. You can read all their dispatches and see pictures from the expedition by visiting www.aai.cc/currentnews. The two guide services, American Alpine Institute and New Zealand-based Adventure Consultants, created an international alliance years ago to offer a wide range of diverse and challenging expeditions and programs all over the world. Guides from both companies have the opportunity to expand their horizons and participate in work trades with the partner company. American Alpine Institute guide Andrew Wexler was participating on a work trade with Adventure Consultants during this Ama Dablam expedition. Congratulations to Andrew and all other guides and team members for summiting!